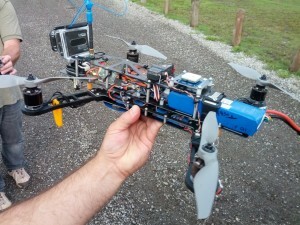 Readers of the blog have probably noticed I’ve been trying to find a way to use Unmanned Aerial Vehicles (UAVs) for SAR operations for about a year now. When I heard that Unmanned Systems Canada, the industry group who is acting as the advisory and best practises body for UAV developers, systems integrators and users were having a conference in Vancouver, I gave them a call and asked them if I could attend on behalf of the volunteer SAR community. It was quite a surprise when they asked me to speak at the conference on Search and Rescue. I ended up attending the entire conference, meeting a huge number of researchers, unmanned systems developers, including military and civilian users and manufacturers. One very important person I contacted was the RCMP officer in charge of the UAV program in Canada. Below is my presentation. I am looking forward to figuring out how we can apply this stuff to SAR. from what I have learned, it’s entirely possible, and would be fairly easy to get a pilot program up and running for certain use cases, as I outlined in my talk. Feel free to contact me if you have any questions about the talk. Another person you might want to speak with is Constable Marc Sharpe – he’s really pioneered the usage of UAV’s in the police field. 3 Pings/Trackbacks for "Unmanned Systems Canada"